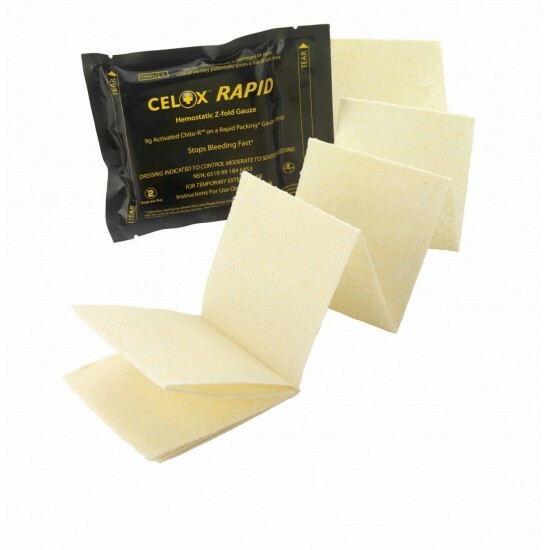 Independent testing2 on Celox RAPID has shown the product works on lethal injruies and significantly reduces blood loss compared to Quikclot Gauze*. As well as reducing treatment time and blood loss, a model of tactical evacuation showed that the Celox RAPID Gauze stayed in place during transport with no re-bleeding3. 1: Testing a new gauze hemostat with reduced treatment time. A Hoggarth et al. Presented at ATACCC Symposium 2011, Fort Lauderdale, USA. 2: Chitosan-based advanced hemostatic dressing is associated with decreased blood loss in swine uncontrolled hemorrhage model. Kunio N et al. Am J Surg 2013. 3: Mechanism of action of rapid-action gauze hemostat. Hoggarth A et al. Presented at ATACCC Symposium 2011, Fort Lauderdale, USA.